Embroidery was quite common on costumes, especially on doublets and robes worn by the nobility. 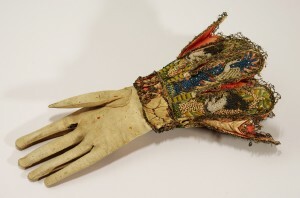 Although we do not know exactly how much of this work was being produced in Wales itself - perhaps the wealthiest people imported garments already embroidered - there is some suggestion in the poetry that women in particular would do some embroidery. Indeed, the fact that the poets often compare weaving and embroidery to their own craft suggests that they were familiar enough with the craft of embroidery itself. Llys i holl Bowys lle bo. a court for the whole of Powys where it is. In other words, the house is worth seeing: as pretty as a picture embroidered on the edges of a garment. Prennol aur nis prynai’r wlad. a golden box that the whole land couldn’t buy. Catrin, growth of a great, fair oak. A droes Dyfr ar draws deufrwyd. embroidering frames, Dafydd Llwyd’s moon. And it is possible that gold roses were embroidered on the purse, Mae rhos aur ar fy mhwrs i ‘there are golden roses on my purse’ (poem 87.48). According to Marged Haycock: ‘The purse was embroidered by Catrin herself: small items such as pillows, purses, collars and belts were mainly produced at home by the fifteenth century’. : See, for example, Rh. Ifans (gol. ), Gwaith Syr Dafydd Trefor (Aberystwyth, 2005), 11.27 and explanatory note, and R. Geuter, ‘The silver hand: needlework in early modern Wales’, in M. Roberts & S. Clarke (eds), Women and Gender in Early Modern Wales, (Cardiff, 2000), 159-85.
: M. Haycock, ‘Defnydd hyd ddydd brawd: rhai agweddau ar y ferch ym marddoniaeth yr oesoedd canol’, in G.H. Jenkins (ed. ), Cymru a’r Cymry 2000 (Aberystwyth, 2001), 41-70.
: D. Johnston (ed. ), Iolo Goch: Poems (Llandysul, 1993), 28.61.
: M. Haycock, ` “Defnydd hyd Ddydd Brawd”: rhai agweddau ar y ferch ym marddoniaeth yr Oesoedd Canol’, in Cymru a’r Cymry 2000/Wales and the Welsh 2000, ed. G.H. Jenkins (Aberystwyth, 2001), 55.